When I was a member of the labor comittee for my orchestra, we would often meet at one anothers house to discuss issues. 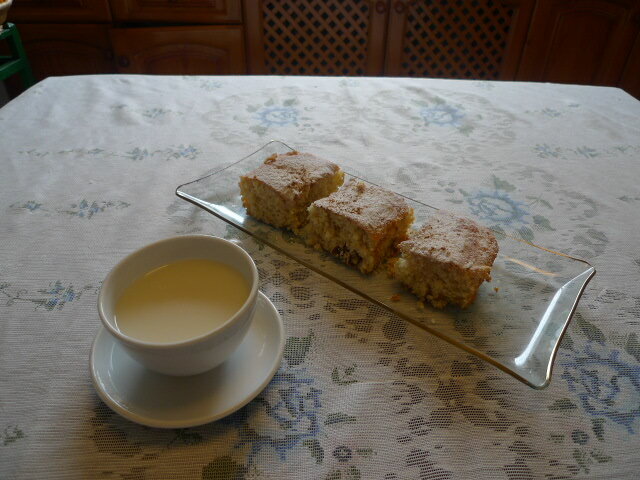 On such occassion, the wife of a fellow member prepared a delicious biscuit for the group. I asked her if she wouldn’t mind giving me the recipe. She generously agreed and so now, my dear readers, I would like to share it with you. I have found that baking helps me to relax before a concert and gives me something wonderful to look forward to afterwards. Enjoy! -separate egg yolks & mix with sugar til creamy; save egg whites for batter. -Add oil, yoghurt, salt and grated lemon rind; mix well. -Add flour and baking powder. Mix well. -Add raisins and ground almonds or walnuts; mix well. -Bake 30-35 minutes, or until surface color changes. -After the biscuit has cooled, sprinkle powdered sugar & cinnamon to garnish. Baking tip: bake the biscuit using the lower heat of the oven. For the last 2-4 minutes, use both upper & lower heat. Ideal to accompany five o’clock tea time! Courtesy of Ruth Engelbrecht, cellist, Granada City Orchestra.